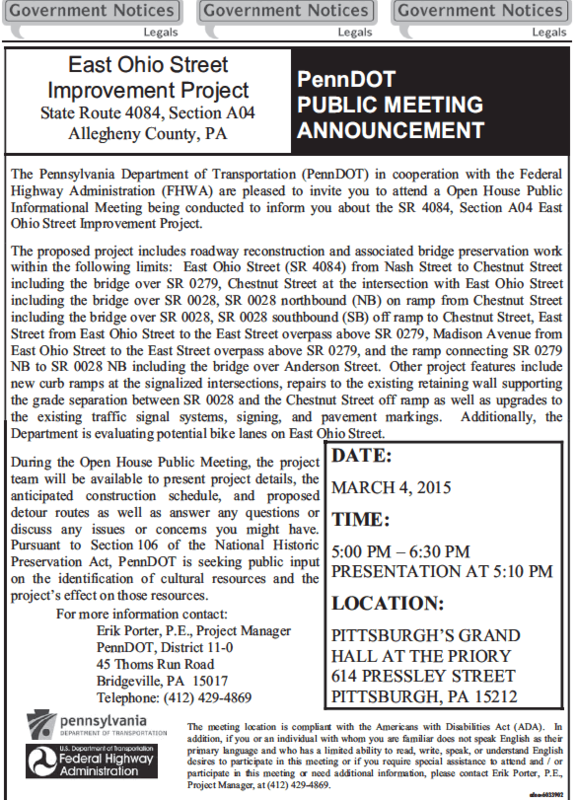 A public meeting will be held Wednesday, March 4 from 5-6:30 p.m. in the Priory hotel’s Grand Hall to discuss PennDOT’s East Ohio St. Improvement Project, according to a press release. One item that will be on the agenda is bike lanes, which would run from the intersection of Chestnut and East Ohio Streets in East Deutschtown to the intersection of East Ohio and East Streets in Historic Deutschtown, including under the I-79 overpass, in the 800 block of East Ohio Street. The committee has continuously worked to bring safer biking and walking routes to Northside, and the East Ohio Street project was no different. Pashek Associates on 619 East Ohio Street provided the concept plans that were submitted to PennDOT. Other items that the project will cover are roadway reconstruction and bridge preservation. A timeline for construction and completion was not available.